Battery capacity has grown steadily, but battery life has remained roughly the same. Welcome to BatterySense, the Battery and Charging research project of the NODES group. 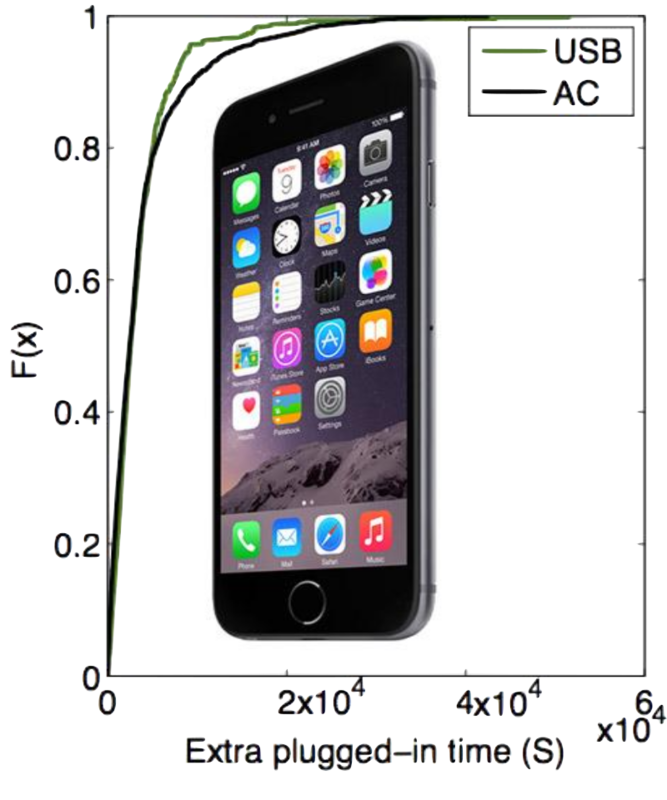 In BatterySense, we study the batteries and charging of smartphones in order to detect and help improve long-term battery life, and develop optimal charging techniques for long-term performance of the battery. We rely on crowdsourced data from the Carat project as well as laboratory and in-the-wild measurements on test devices. In addition, we study the theoretical and practical bounds of charging, such as the safe temperature range of charging and how it changes over time as devices and batteries age. Charging of batteries in smartphones, appliances, and electric vehicles is a global issue. 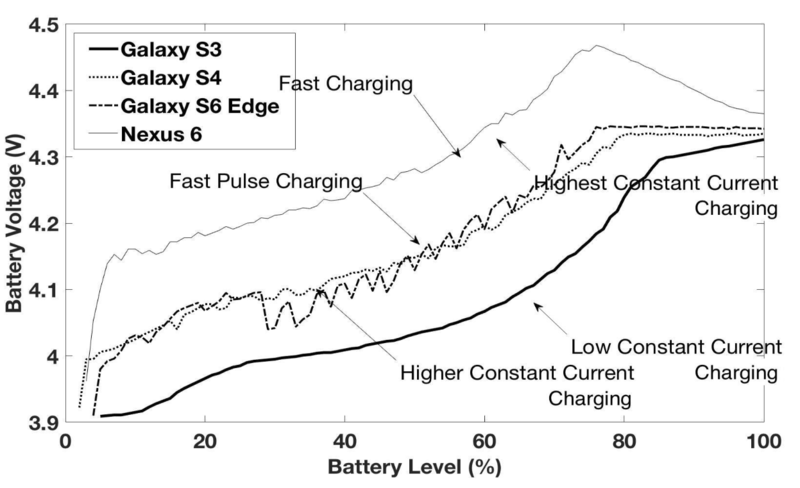 Fast Charging has not been studied from the point of view of long-term battery damage. Our results show that batteries are left in the charger overnight, and in addition to unnecessarily charging the device, use around 2000 mAh extra energy (enough to fill another smartphone battery). Battery capacity has increased in the last few years, but battery life has stayed roughly the same. As smartphone hardware becomes increasingly powerful, also energy conservation grows more important. 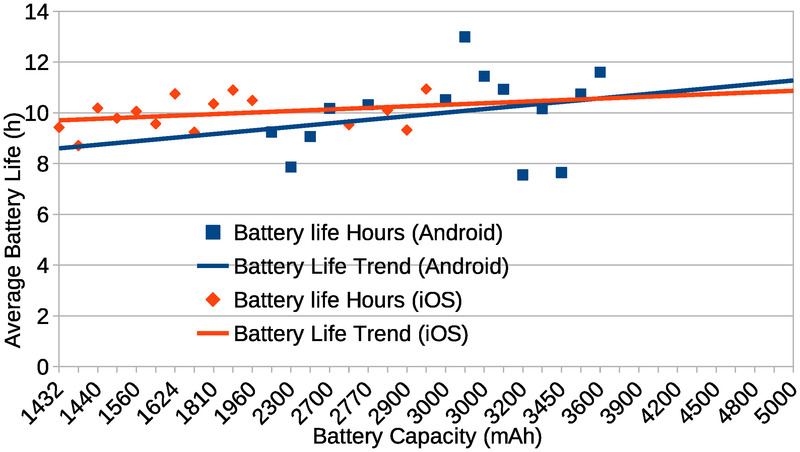 On the right, we can see that battery capacity has doubled, but battery life in hours has barely grown 10-20%. The same trend is expected to continue. 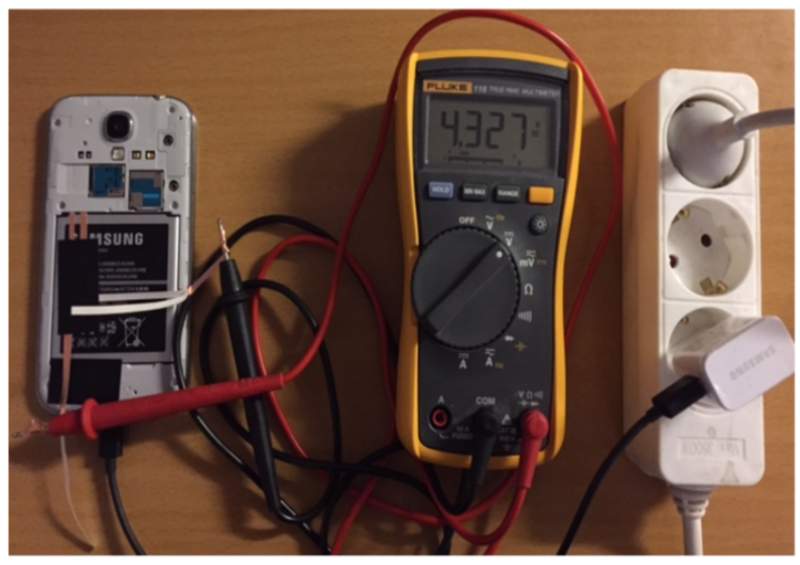 On the left, various charging techniques are used in recent smartphone models. They have a different impact on the long-term condition of the battery. The general approach to charging Li-Ion batteries is to first use a high current, high voltage phase to charge the battery to a preset level, such as 40-60%. Then a slower phase is used to top off the battery to near 100% of the design capacity. Typically, slow charging causes less battery damage, but takes longer to charge the battery. Battery chemistry, capacity, and determine the maximum charging speed before temperatures exceed safe levels. Despite the above, it is possible to charge a battery with the wrong charger, causing battery degradation, unnecessarily slow charging, or both. The BatterySense Research team includes Dr. Mohammad Hoque, Dr. Eemil Lagerspetz, Jonatan Hamberg, and Prof. Sasu Tarkoma. Most of us are also involved in The Carat Project. For more information contact Dr. Mohammad Hoque or Dr. Eemil Lagerspetz (first.last at cs helsinki fi).